"I picked up the hunting knife with my left hand and tested its heft, then shifted it to my right hand to compare. Golfing and batting, I'm a lefty, but I grade papers and dial phone numbers with my right. The knife felt more at home there, too. Okay, I thought, add 'stabbing' to the list of right-handed activities." "Couldn't you have just put it in an autoclave, wrapped in some paper towels?" "Sure. But where's the fun in that? It's not every guy who gets to play with fire on the job." "Are you never going to grow up?" "I sure hope not. My childlike immaturity's the only thing standing between me and a major mid-life crisis." We all know I like to look at the Real Estate pages, although lately I look at some of those homes and wonder just how "real" these estates are. I've never heard anyone say 'ello 'mate. 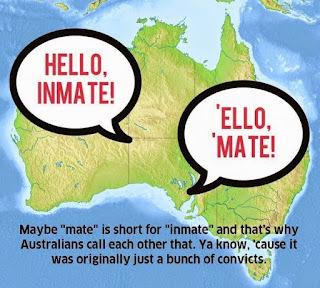 It's always G'day mate.